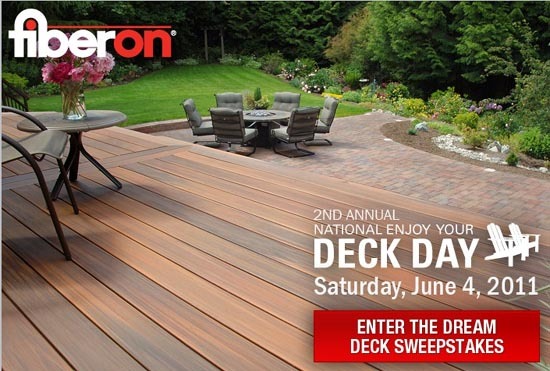 Fiberon Composite Decking is happy to announce that the second annual National Enjoy Your Deck Day is quickly approaching! Join people nationwide as they celebrate outdoor living on Saturday, June 4, 2011. They are kicking off the celebration a month early with weekly giveaways and the chance to win a Fiberon Horizon composite dream deck. Beginning May 9th, you can enter to win weekly giveaways. By answering a simple question at http://www.deckday.com, you are automatically entered to win that week’s Deck Day-inspired prize. Check back each week for more chances to win! One lucky homeowner will win a Fiberon Horizon® composite deck in the color of their choice. You’ll also get money towards labor and additional funds to help you throw a party on your new deck. By entering, you are eligible for both the week’s secret prize and the grand prize deck. There’s more! Home Construction & Improvement wants to hear from you. In addition to the giveaways for Deck Day above, answer the following question in the comments below to enter to win a $100 “Deck Party Certificate” for throwing your own outdoor bash! Question: If you could have any unique feature on your deck, what would it be? Entertainment – Have music, an activity or game prepared. Keeping guests entertained will help ensure an enjoyable get-together. Design – Is your outdoor designed for fun? Do you have enough space for everyone to kick back and relax? Lawn and Deck Care – You can’t have a successful outdoor get-together if your lawn is overgrown and your deck is a mess. A little maintenance goes a long way in pleasing the crowd. Food – What brings people together more than great food? Make some great recipes or ask guests to supply a dish. For more information or to enter to win the Fiberon Composite Dream Deck Sweepstakes, visit http://www.deckday.com. The $100 “Deck Party Certificate” for one of our HCI Readers will be awarded on Monday June 6, 2011. All entries must be entered by 11:59 pm on June 5, 2011. Only residents of the U.S. are eligible. One entry per household. Spam entries will not be counted. Spam entries are determined at the sole discretion of Front Steps Media. Self cleaning would be nice. One of my most loathed jobs every year is powerwashing the deck. We have a firepit in the woods where we enjoy hot dogs and s’mores in the summer, but I’d love to have an outdoor fireplace as part of our deck. We have cool springs and autumns and I’d love to lengthen our deck season by being able to sit by a great fire! A great unique feature would be built-in planter boxes, and maybe some cupholders somehow so drinks don’t get knocked over or off railings and tables and such. I’d love to have recessed lighting in the rails as well as attractive bug zappers/repellents to keep those pests away during the evening hours. Since we are in the deck planning stage right now, love hearing the ideas. We would definitely want enough space to have an eating area and a relaxing area. Love the recessed lighting and even a fire pit. Definitely need some speakers back there to enjoy a party. Built in fire pit would be a nice feature. Lots of food and refreshments for the party.